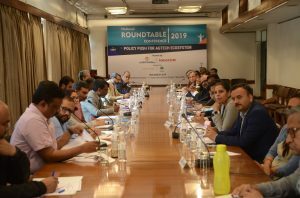 NASSCOM and ICFA partnered to organise a roundtable to bring multiple central agencies and state governments together for a discussion with the technology sector. The meeting was attended by representatives from DIPP, Ministry of Agriculture, Ministry of IT, NITI Ayog, NABARD, Maharashtra State Innovation Society, Govt of Kerala, Bangalore Bio Innovation Center, AP Innovation Society, National E-Governance Division and Digital India Corporation. On the technology side, the table comprised of startups, large IT companies and funders, such as IBM, TCS, Satsure, BigHaat, Yes Bank, Amazon AWS, farMart, Cropin, Bharat Innovation Fund, Omnivore, Mycrop etc. I understand the readers will be interested in what the governments and state agencies said, let me focus on the most notable ones. Ministry of agriculture highlighted the need for robust database of farmers’ data. Startups were asked to provide solutions in logistics, food processing companies, ensuring development of cold chains and storage facilities. Ministry of IT talked about digital infrastructure and about Soil Health Card, M-Kisan, and E-nam. They talked extensively about scheme TIDE- Technology Incubation and Development of Entrepreneurs. In first phase, 27 TIDE centers had been set up with 7 focus areas, agriculture was one. In second phase, 51 centers are to be set up to promote 2000+ startups. They also talked about the app developed by Digital India Corporation under MEITY called mAgri. NABARD reiterated the importance of working with FPOs vis a vis working directly with farmers. They also talked about NABventures which is the funds of fund NABARD IS doing and lending it to startups working in agriculture and rural sector. NABARD has setup 2 incubation centers – Haryana Agriculture University and Tamil Nadu with investment of 12 crores each. Maharashtra State Innovation Society (MSIS) talked about the grand challenge where they find projects in different ministries that startups can work on. Satsure won this year and has been given a work order worth 15 lakhs. MSIS is also working on policies so that they can give some money to startups in advance. Bangalore Bio Innovation Center explained how Karnataka is going against conventional logic and working as a VC fund. AP Innovation Society talked about two of their programs – SOCH (Sunrise Open Challenge Hackathon) and Farm-to-Fork accelerator program called Fortissimo. Andhra also stated they are taking up policies where the initial seed funds can be given as grant fund. Space constraint does not permit me to talk about the discussions from technology side in this piece. Hemendra Mathur talked about the need for a catalytic fund. Amardeep Sibia talked about difficulty in bank guarantee for getting advance money. Sachin Nandanwa pointed out how every district reads regulations in input policy differently and how India Post could do much better when it comes to agri input deliveries. Kunal Prasad stressed the need for government to engage startups in bigger projects and also to make agri data available. Government was asked to offer support in terms of incubation, acceleration, and catalytic funding. Incubation centers should be opened and curriculum changes to be made in agricultural universities. Land record should be digitized and financial inclusion policies should use technology solutions. State governments should set up catalytic or micro funds (ranging 15 cr. to 100 cr. ) to spur innovation. Licenses need to be centralized, every state should not ask for local office/warehouses. Governments should engage startups in larger projects. Data need not be free, data market models can be explored where people can access, buy, leverage it and to ultimately reduce our service delivery cost to farmers. Data sharing policy should include bulk sharing of transaction / observation data rather than MIS reports. This becomes key requirement for AI based solutions. Such data can be shared through an API and there can be a registration process for accessing such bulk data. NBFCs have started offering working capital loans to AgTech startups however these have very high interest rate nearly 24%. Capital with lower interest rates needed. Part of collected GST should be refunded to startups if they are not able to set off. Digital payment collected charges should be compensated. Grand challenges and agri schemes should be better marketed. NASSCOM can play a role. We will keep you updated on the progress as and when they happen.